Clemson Girl: McAuley’s Unique Boutique has even more chic gameday styles – be the belle of the ballgame and get 15% off! McAuley’s Unique Boutique has even more chic gameday styles – be the belle of the ballgame and get 15% off! Homecoming is just around the corner… do you have your gameday outfit picked out yet? Well, just when you thought you couldn’t love McAuley’s Unique Boutique in Anderson any more, they get even more styles and selection for Clemson gamedays! When McAuley’s emailed me yesterday with photos of their new styles, I couldn’t wait to share them with you. Note: If you see a style you are dying to have in this post that isn’t on their Web site yet for ordering, you can email customerservice@shopmcauleys.com or call 864-226-7773. Check out some of the looks you can get at McAuley’s Unique Boutique for gameday… they have included more orange and black to represent Halloween in addition to Clemson. :) Fun! The look: Jeans and tunic tops or large cardigans… love this – skinny jeans with big, clunky boots and a great top. Comfortable and stylish… the first look is my favorite! The look: One dress, multiple styles – I love this orange dress – very simple, yet look at how many different looks you can make with it just by changing up the accessories. Worth the investment for so much versatility! The look: Skirts! Skirts are fun because you can mix and match them with different tops, leggings, boots, heels, etc. etc. etc. These skirts are great – and not just for gamedays. I want the white, tiered ruffled skirt.. need it! The look: Leggings and tights – The weather is cooling down (hooray) and Fall is almost in full swing – you want to look super cute on gameday, but you always wear jeans. Well, you can still wear your favorite dress or tunic top with tights or leggings – pair with great shoes and a jacket and you’re good to go for gameday! So what do you think about these gameday looks? Guess what? McAuley’s Unique Boutique is getting even more orange and purple gameday looks in this week, including a ton of orange jewelry and scarfs – become a fan of their Facebook page to stay up to date on all of their latest styles and to get special discounts you can't find anywhere else. McAuley’s Unique Boutique has so many great styles for Fall – for all occasions even outside of Clemson gameday outfits. Check out their Fall lookbook online - http://www.shopmcauleys.com/seasonal-lookbook/. Click the ‘View Outfit’ and it will show you each piece of the outfit and whether or not it’s in stock. It’s like an online fashion magazine. Do you want to see some of these looks in person? You can! McAuley’s Unique Boutique will be showing off 20 of their chicest fashions in the Salon Soluna fashion show this Thursday, Oct. 29th, at the Brooks Center in Clemson. 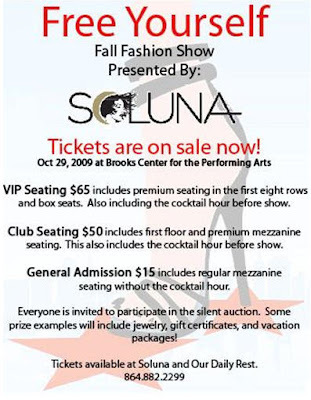 Cocktails start at 5:30 p.m. and the fashion show starts at 7:30 p.m. You can still contact Soluna for tickets at 864-882-2299. All ticket proceeds benefit Our Daily Rest homeless shelter. I wish I lived nearby – I would definitely go! Phew! So many exciting events, specials, and new looks with McAuley’s Unique Boutique. Don’t forget you can get 15% off in store by mentioning ClemsonGirl.com or online with coupon code Clemson15. Comment on this blog and let us know what your favorite McAuley’s looks are! I can’t wait to see your Homecoming gameday outfits! !